The Wii U Chat service will be discontinued with Miiverse on November 8th 2017. Find out more about the Miiverse service discontinuation. Easily communicate with faraway friends and family without the need for extra equipment – all you need is the Wii U console, Wii U GamePad and an Internet connection. Gather the family around the TV and share your living room with distant friends and family. With the Wii U GamePad's built-in camera and microphone, you can easily communicate with other Wii U owners anywhere in the world. Watch the first call ever made with Wii U Chat, featuring former Nintendo Global President Satoru Iwata and Nintendo of America President Reggie Fils-Aime. Check out Nintendo's new Wii U console and see how it changes the game! If you and a friend want a quick catch-up, you don't even need the TV on to use Wii U Chat. Get comfy with the Wii U GamePad and chat away from the TV. Starting a conversation in Wii U Chat is easy. Just select the Mii of the registered friend you'd like to talk to, and you'll be chatting in no time! Have even more fun with your chat partner by drawing and writing messages to each other on the Wii U GamePad touch screen. If you're using Wii U and a friend tries to contact you, the Wii U GamePad HOME Button will blink. Simply push the HOME Button to respond! Plug a supported headset into the audio jack on your Wii U GamePad and chat away! 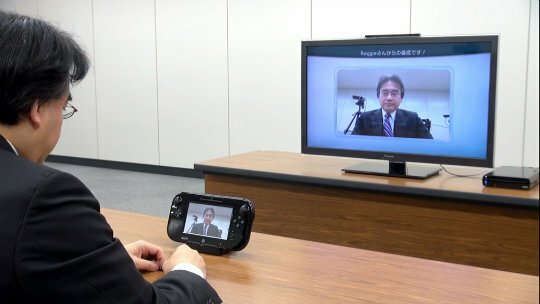 Learn more in the interview Iwata Asks: Wii U Chat and find out how to register friends at our Support section.